Where does the word Easter come from? The word Easter is not in the New Testament. Nor does it feature in most translations of the Bible into vernacular languages. Isn't Easter linked to Passover? 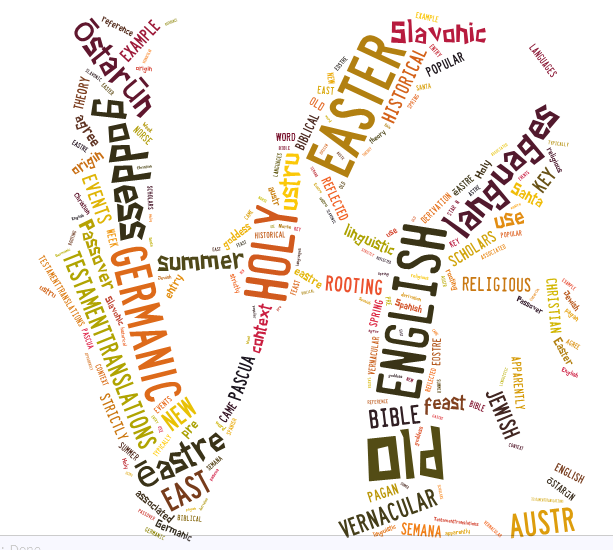 There is no direct linguistic link between the English word Easter and the Jewish feast of Passover. This contrast with the convention in Romance languages. Pâques, in French, covers both Easter and Passover. In Spanish, Semana Santa (Holy Week) is the most common phrase used to describe the festival. So where does the word Easter come from? Scholars agree that Easter has pre-Christian roots. Beyond that there is little consensus. According to the great Anglo-Saxon scholar the Venerable Bede, the Old English word eastre came Eostre, "a goddess associated with spring." April was called Eosturmonath ("Easter-month") because in pagan times the month was dedicated to Eostre, an Anglo-Saxon goddess of spring. The Canadian Oxford Dictionary suggests a link to the Germanic goddess Eostre. It cites Old High German ōstarūn Easter, Old Norse austr to the east, Old Slavonic ustru like summer. Another theory is that Eostre was simply the Anglo-Saxon word for spring festivals. Linguists trace this word to roots thousands of years old meaning "shine" and "dawn." Spring is a season of lengthening days and increased light. It would make sense for early peoples to give their spring festivals a name that celebrated the rising sun. advanced vocabulary CEF English Language Level C1 easter language of Easter religious language Where does this word come from? Why do we say ...? Labels: advanced vocabulary CEF English Language Level C1 easter language of Easter religious language Where does this word come from? Why do we say ...?